What is the best way to display the stone? its degree of translucency. Experiment and enjoy. What are some handling and safety considerations? heated by open-flame, use gloves, pot-holders or kitchen-mitts to hold the stone. box that is equally filled with packing. 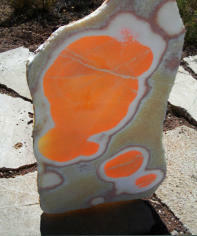 Will the color fade if the stone is placed in direct sunlight? liquid UV protective sealer coating is applied to surface of stone. on indoor window sills with indirect sunlight, should see minimal effects of UV light damage. 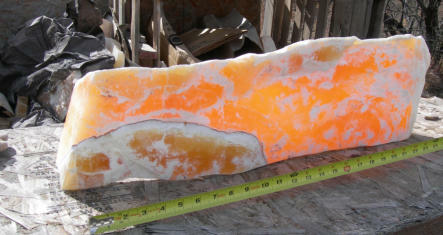 Will Honeycomb Calcite become florescent if illuminated by a black light? What is the white frosting on top of the cylinders? The outer ‘skin’ of each stone seems to have some thickness of a hard white-chalky layer. react with carbonate ions to create a limescale (limestone). skin of the stone. In most cases, the white coating tends to make the piece more visually interesting. Can I order matching cylinders or slabs? 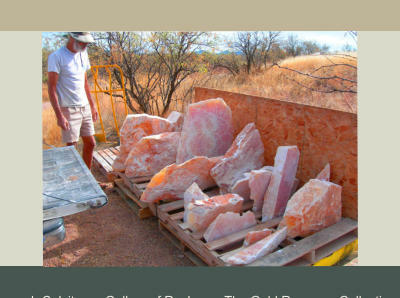 Each quarried boulder is unique in its cell pattern and color, thus no two pieces are the same. some degree of similarity the cell structure and color gradients. What ‘finish’ work is performed on the stone? stone fabrication. Small sculpted boulders are usually acid-washed.